Bugs are hard enough to find in a complex design, whether you're debugging at the HDL level, the testbench level, or the verification intellectual property (VIP) level. Bugs often appear as errors dozens or hundreds of cycles separated from their actual occurrence. With these challenges, design and verification engineers need sophisticated tools to find bugs in the haystack of data produced by the simulator. Through the Cadence® Indago™ technologies, you'll find sophisticated solutions to address RTL, testbench, VIP, and SoC verification debug needs. Our Indago Debug Platform can improve your debug productivity by up to 50%, applying advanced data exploration techniques to hardware verification for smart debug and increased automation. Designed to break down the verification bottleneck that exists in traditional debug flows (see Figure 1), the Indago Debug Analyzer App was developed with sophisticated debug technologies such as automated root-case analysis (RCA) and advanced data exploration techniques. The app, integrated into our Indago Debug Platform, is suited for testbench and RTL debug and helps you uncover bugs 50% faster than with traditional sample-based debug methodologies. Advanced data exploration techniques involve a passive collection of a complete set of data points for powerful and detailed analysis at a very low cost. Using these techniques along with analysis and powerful algorithms, the Indago Debug Analyzer App, as shown in Figure 2, analyzes each debug point as you navigate your design (messages, waveforms, source execution order, call stack, active threads, etc.). At each point, the app identifies causal relationships for the most typical debug questions, which are presented to you in an intuitive RCA GUI component. Using the RCA component, you can intuitively click your way through the complete failure scenario, seamlessly diving into the testbench or RTL code to quickly diagnose the root cause of the failure. To ensure that you can retrace your debug steps, each debug decision taken in the RCA component is saved in an investigation tree. As shown in Figure 3, when you initially launch the Indago Debug Analyzer App, its GUI opens to display SmartLog, an interactive log analysis tool that is hyperlinked back to the source code. The GUI opens with the first error already highlighted, so you can start debugging right away. The source browser displays the error message and allows you to step forward/backward through the recorded data to “play back” the bug scenario from any point that you find interesting. Figure 3. 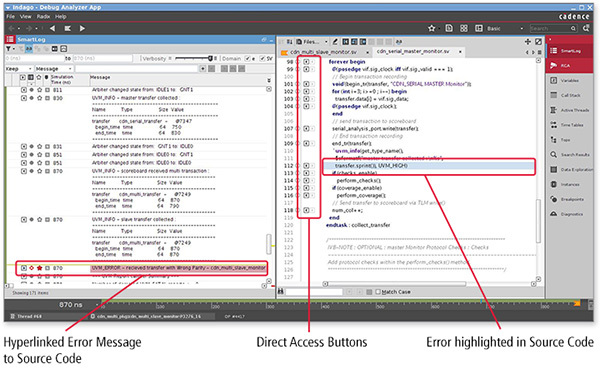 Indago Debug Analyzer App opens with the error highlighted, so you can debug immediately. 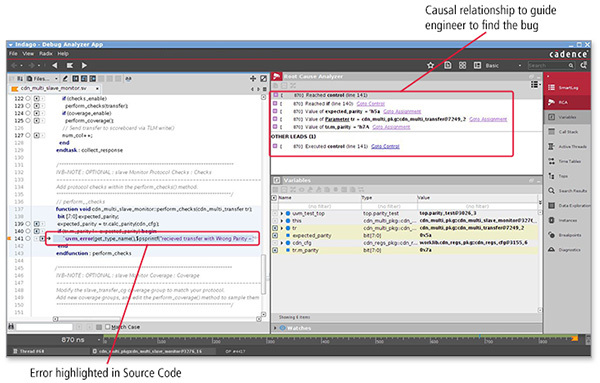 By analyzing the recorded debug data collected, the Indago Debug Analyzer App can provide a list of causal relationships that answer the most common debug questions, as shown in Figure 4. The intuitive, flow-oriented debug environment helps you determine where to look to debug. You'll get guided questions and answers from the GUI to help you debug the error. Figure 4. Indago Debug Analyzer provides you with causal relationships to allow you to quickly get to the root cause of any issue within a few clicks. Also, while debugging, if you find a value of interest, you can easily highlight it within the GUI. This highlight is then applied to every location where this value appears, including in the waveform window, saving you time when switching between various contexts and comparing lengthy values. With powerful querying capabilities, you can quickly analyze when and where variable values were updated and when specific source lines were executed throughout the recorded window. Single stepping forward or backward in time without rerunning the simulation. Every executed line has direct access arrows that enable you to go directly to the execution of the line, forward or backward in time. Users can highlight values, set bookmarks, write notes, and save the current state to allow for quick handoff to another engineer to continue the debug process. Allows geographically dispersed teams to exchange debug data much more intelligently and efficiently. Dynamic message viewer with fast filtering of messages from many sources. Can add print statements to SmartLog directly from the source. Also has the ability to change the displayed message wording without rerunning the simulation. Cadence’s Indago Debug Analyzer App has improved our debug productivity up to 50 percent because it helps us find the root cause of the bugs faster. We believe the Indago Debug Platform will enable us to continue to deliver for applications including consumer electronics, fitness tracking, wearables, and IoT.